I have been gardening this way since I realized that the sunniest sections of my garden were also the ones with the shallowest soil. When I say shallow, I mean three or four inches of decent soil that sits on top of enormous limestone boulders and bedrock. I've been able to pry out smaller rocks and plant a prized wildflower, but not always. 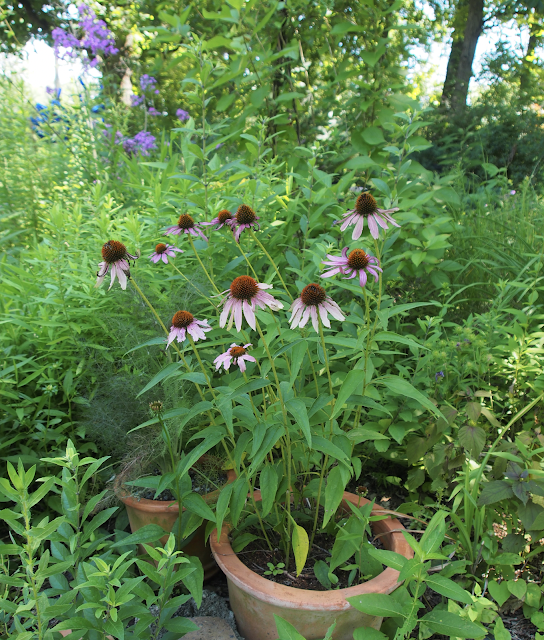 It used to be maddening, then, I figured out that those shallow spots were opportunities for me to add my favorite native wildflowers to the garden...in containers! In this front garden bed (April 2017) I have two containers of Boltonia, a lovely glazed purple pot with Phlox 'Jeana' and several pots of Liatris spicata. Early this summer I added two large containers planted with non-native Salvias and African Blue Basil that bloom until frost. The pollinators love them. Where ever there's sun I place containers. 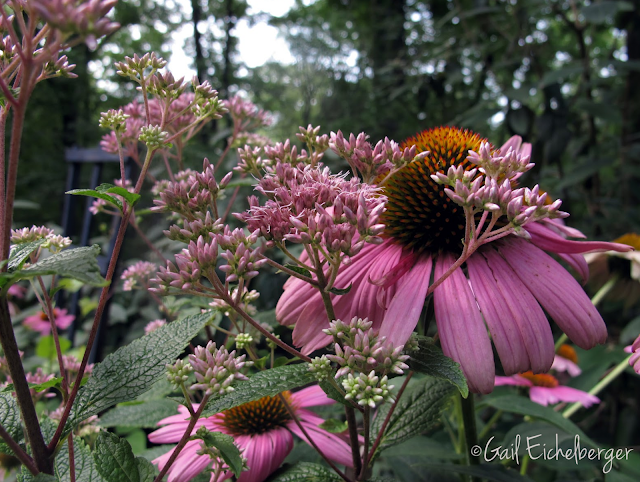 You'll find dozens of wildflowers planted in containers at the top of the driveway. There's also a ten foot culinary bay tree and a large Rosemary. I've even planted evergreen shrubs in large galvanized trash cans to use as room dividers and to hide the real trash cans. 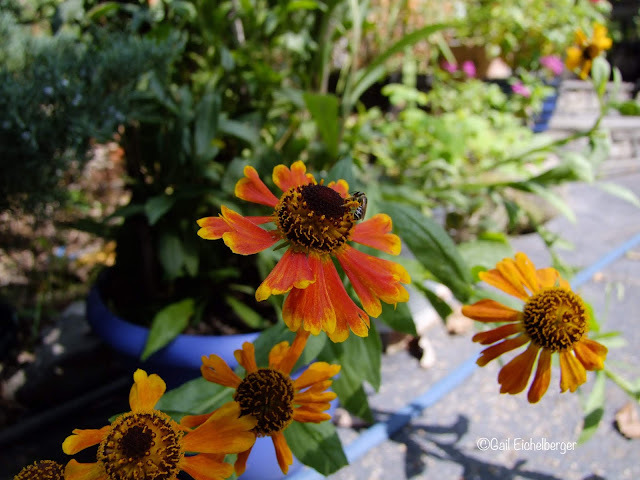 The only way I can keep Helenium alive is in a container. I've successfully over wintered Pycnanthemum muticum, Heleniums, Echinaceas, Boltonia, Asclepias, Coreopsis, Liatris, Phlox, Rudbeckia, Penstemon, Monarda, Physocarpus opulifolius, and Hydrangea arborescens cultivars. More often than not, plants thrive in the containers for years. Occasionally, I will transplant them into the garden to replace any plants lost over a too dry summer or too wet winter. For long-term container planting, I use a mix of real soil (yes, real garden soil), compost and soil conditioner. When sharp drainage is essential I add expanded shale to the mix. I mulch with leaf mold or mulch, just like I would in the garden. I use an assortment of containers: colorful glazed pots (frost proof), terracotta, galvanized trash cans and faux terracotta (plastic). I have even planted ferns in hollow logs. Frost-proof containers add color to my gardens all year long. Simple painted bamboo poles light up this spot when the pretty fall color have disappeared. Here's an idea you might try. This terracotta pot (above) lost its bottom to winter freeze/thaw, so I placed the container in the garden, added soil and planted Echinaceas. The roots have grown further into the shallow soil and appear to be quite happy. 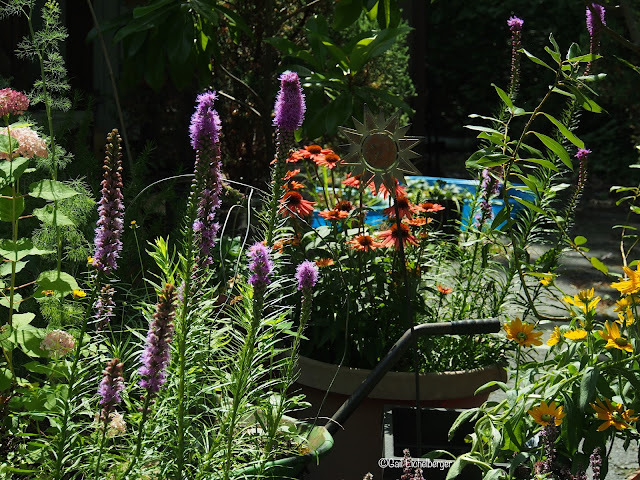 Containers are a great choice for plants like Agastache and some Penstemons that need sharp drainage. They used to drown over the winter, but, not anymore. To make sure the soil is fast draining, I add expanded shale to the potting soil. So far the plants are very happy. I've had great success growing shrubs and trees in containers. Two of my favorite H arborescens cultivars-'Emerald Lace' and 'Hayes Starburst' have thrived in pots for years. Another cultivar (seen below) was sent to me to trial. It arrived too late in the season to be planted in the garden, so it over wintered in a container. It's now been transplanted to the woodland garden and is doing fine. Containers don't have to be jam packed with non-native annuals, nor do they have to make a seasonal statement! 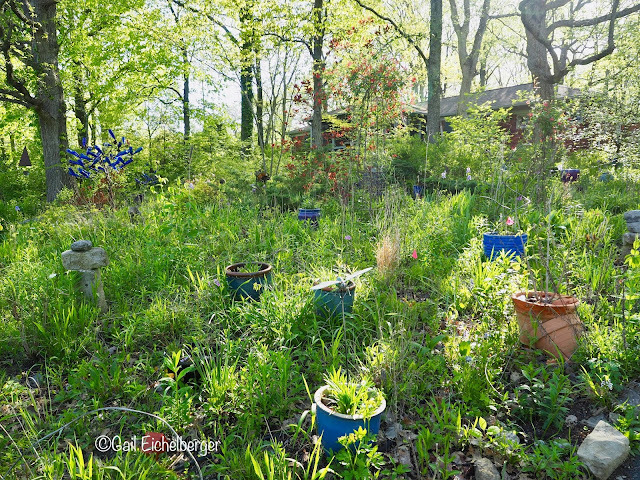 If you want to garden for wildlife and pollinators, don't let lack of space stop you! Plant your favorite wildflowers and see what happens. You just might have the prairie or woodland garden you've always wanted. Zone: Middle Tennessee is Zone7a, but, when I first began gardening in containers it was 6a/b. Most of the wildflowers and annuals I plant can tolerate the occasional Zone 6a winter. I do cover them with sheets and protective cloth if we have a late spring frost/freeze and they've broken dormancy. Aspect: Sun, part sun, shade and full shade. Soil: Good soil is essential. I don't like potting soil, it's too light and dries out too quickly so, I make my own container soil of real garden soil, soil conditioner (finely ground bark) and compost. The soil conditioner makes the soil aerable. Bloom: Spring until late fall. 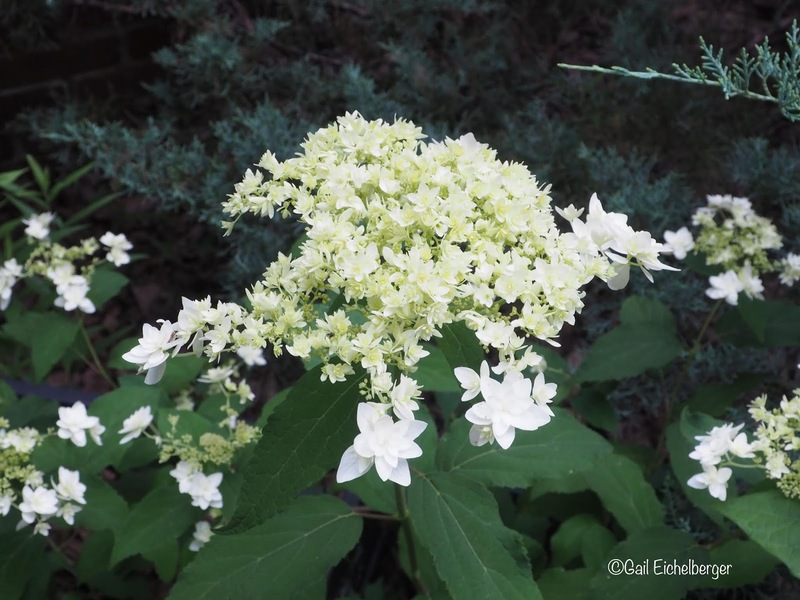 If you plant a winter blooming native shrub or tree, you will extend the bloom time. Size: Size and depth of containers depends on plant requirements. You can find large and extra large containers almost everywhere. Your budget and whether they can be overwintered outside will determine how large you want to go. The bigger the container, the harder it is to move indoors. Maintenance: The one constant is watering. I don't have to water the big pots daily unless temperatures are extreme (July and August), but as the containers get smaller they do require a daily big gulp (15 seconds of hose watering on average for most containers, longer for shrubs and trees). The Rosemary and Bay tree spend the winter in my unheated garden shed and get watered a few times. I don't move the wildflower containers inside. If you live in a colder hardiness zone, I recommend that you move the containers to a protected spot (garden shed or garage) or transplant the perennials into the garden. 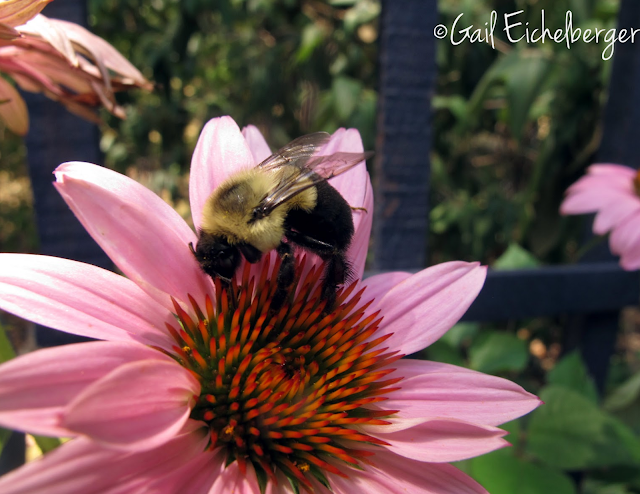 Wildlife value: What you plant in your yard makes a difference to wildlife. I garden for wildlife so every tree, shrub and plant is chosen with wildlife in mind. 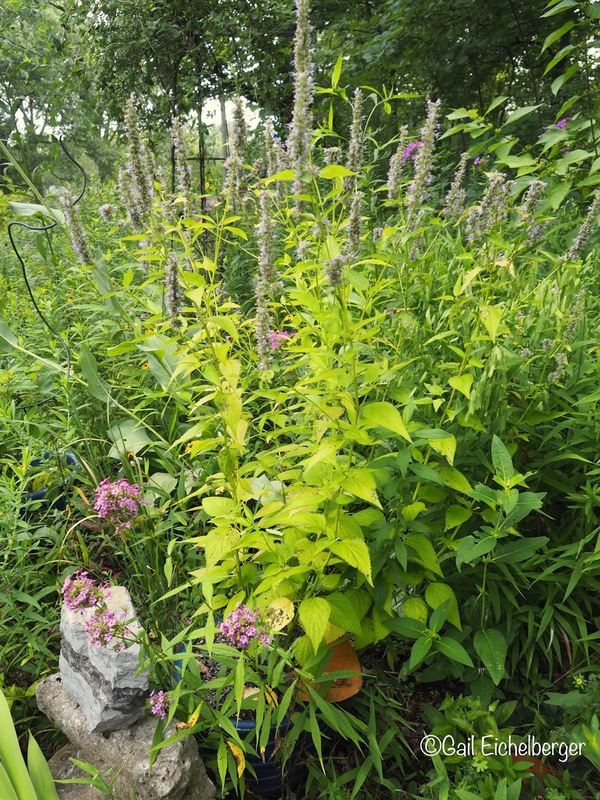 Plant your favorite native perennials and shrubs. Leave them standing after they've gone to seed to continue to provide for wildlife. Containers: Use your imagination when thinking of containers. 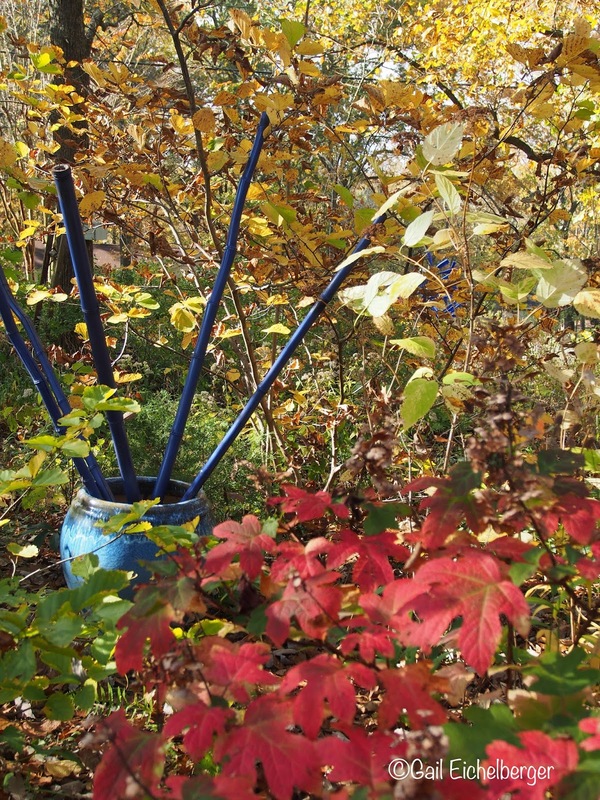 I use colorful glazed pots (frost proof), terracotta, galvanized trash cans and faux terracotta (plastic). I have even planted ferns in hollow logs.You might enjoy formal urns or contemporary containers. Plant combinations: Plant a hummingbird container with Aquilegia canadensis, Monarda didyma, and Lobelia cardinalis. Prairie planting with Panicum virgatum and Solidago and Rudbeckias. The possibilities are endless. As a reminder to all! 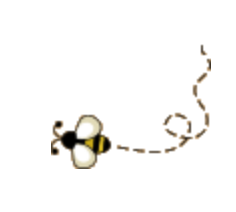 Never, ever, ever, ever, ever use pesticides. I mean NEVER. Also, never, ever, ever dig plants from the wild. Purchase them from reputable nurseries. 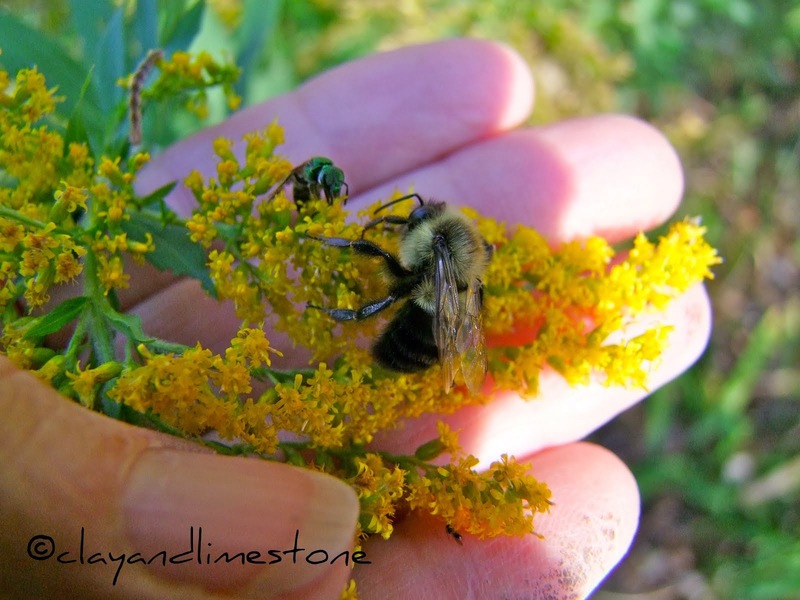 Welcome to Clay and Limestone and Wildflower Wednesday. 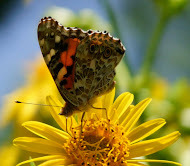 This day is about sharing wildflowers and other native plants no matter where one gardens~the UK, tropical Florida, Europe, Australia, Africa, South America, India or the coldest reaches of Canada. It doesn't matter if we sometimes share the same plants. How they grow and thrive in your garden is what matters most. Just brilliant! Thanks for such an inspiring post! I have to try more pots...less vole issues! I just might have too many containers...ha, you cannot have too many can you? I love this approach -- I usually have between 4-10 containers, and frequently use native perennials in them, too! I'm actually doing a program in late September about small-scale native plantings and will add some of your suggestions. Brilliant! Your garden is delightful whether it is pots or plants that are the attractions. I also have had natives in pots. They are tough and stand up to my general neglect of pots. Beautiful post. Yes, to containers everywhere! I love the idea of placing containers throughout the gardens. My biggest issue is/would be watering. I'm not terribly good at remembering to water pots daily. Last year was my first summer to try gardening with native plants in containers up next to the house. I've added quite a "garden" of containers to our patio and enjoy having the blooms up close and personal. I'm still working out the specifics, though - right now, for example, I have too much greenery and not enough blossoms. Always something new to figure out. I love your idea of planting evergreen shrubs in galvanized trash cans and using them as a portable "wall" for privacy or screening! Genius. The painted bamboo sticks for winter color are a great idea, too. Our neighbors cut down several hollow trees this spring, so I've snagged some of the sections and I'm planning to plant in them. I've only managed to get one planted up so far, though, and I'm still trying to decide what plants, exactly, I want to put in them. I do love the look. I'd be curious to know which "stump" plants have worked well for you. Good advice, Gail. I've been doing some of this, myself. We find little tricks when our gardens are shady, don't we? Happy WW! I use pots to keep track of bulbs. Would never find those tiny bulbs again, but the labels do go walkabout. My white freesias are scattered across MANY pots. Small pots are a mission to water, especially when the rain the bulbs need doesn't happen. Very interesting post! Here in zone 5, I have not had much success trying to overwinter perennials in containers, though I've had some luck with bulbs. Isn’t it interesting how we can adjust our gardens to our personal whims? I wouldn’t think to plant natives in containers, but you are making it work for you! I'll stick just about anything in a container! My new garden is pretty shady so it will be a challenge to fill it with pollinator-attracting plants but I'll figure it out!